"Before" vs. "prior to": What's the difference between them? “Before” vs. “prior to”: What’s the difference? If you’re someone who writes or creates content, there’s a dilemma you’ve probably faced: whether to use “before” vs. “prior to” in a particular sentence. For example, which one could you use here: “We considered all the evidence _____ making a decision”? Would you choose “before” or would you place your bets on “prior to”? You may be confident that you know which one fits. But do you really know the right answer? “Before” vs. “prior to”: Which word could you use? 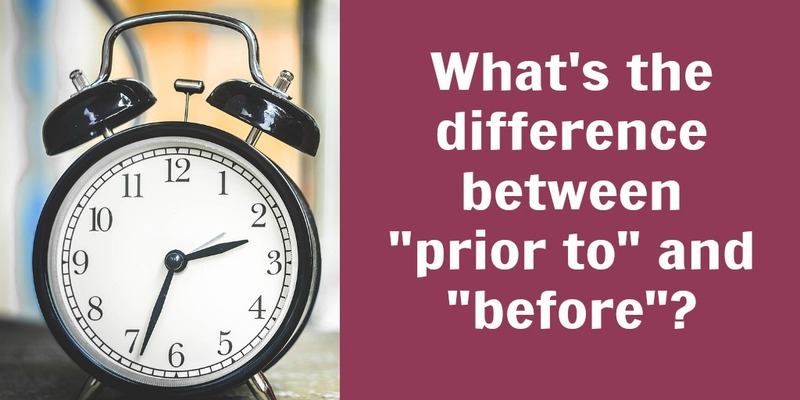 “Before” vs. “prior to”: Which word should you use? Now, just because you can use either “before” or “prior to” in any sentence doesn’t mean you should. It’s true that “before” vs. “prior to” are both grammatically correct choices for a sentence. But that doesn’t mean that they’re equally good choices. We know what some of you are thinking: “‘prior to’ is a better fit for a project proposal or report because it sounds more formal.” After all, you’re probably used to seeing corporate and legal documents that are peppered with this term. In reality, though, “prior to” is just a Latin-based synonym of “before” that sounds unnecessarily formal. In fact, the Merriam-Webster dictionary notes that some people even see “prior to” as pompous. And you don’t want to seem pompous, do you? Want more tips on how to produce clear and concise content? Read our post on how to shorten long words and sentences. Inpression Editing helps businesses, professionals, and students make the best impression possible on customers, investors, hiring managers, and admissions committees. We do this by providing copywriting, editing, and writing coaching services for website copy, blog posts, marketing materials, personal statements, and much more. Located in Toronto, Canada, we provide all of our services in both Canadian and US English. Get an instant quote here.